I'm keen on making science accessible to anyone. I have used a variety of channels to share findings of my own research, and to advocate for nature and conservation. I'm passionate about generating quality engagement in science – especially through visual mediums and pop-culture-filled talks. If your project needs some sweet juicy visual treats, don't hesitate to get in touch! Infographic summarising key findings from my PhD. 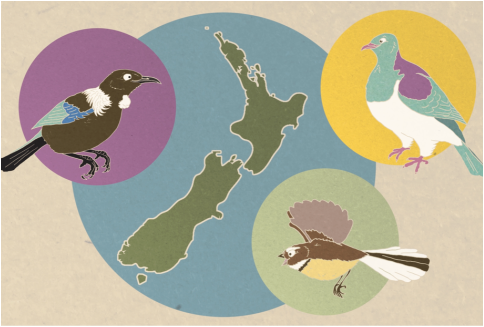 'Feeding New Zealand's Birds' – Science animation based on my PhD findings made in collaboration with Lu Davidson from Matai Media. 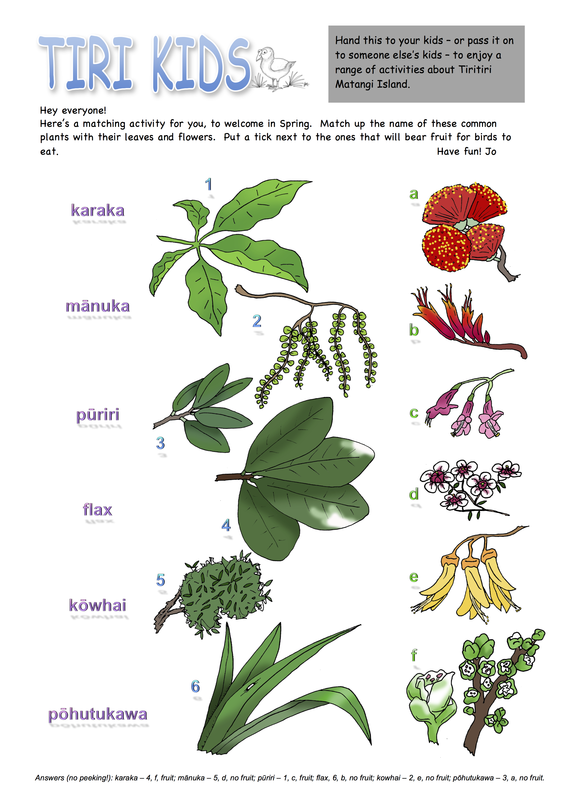 Tiri Kids nature activity page for Dawn Chorus magazine (Supporters of Tiritiri Matangi). 2017 Invited scientist, mini 'Bioblitz' day at Summerland Primary School. 2015 Invited scientist, Wild Eyes (digital media project) bird feeding workshop for kids, Tiritiri Matangi Island, Auckland. Talk on bird feeding, sugar water feeder hands-on workshop, bird feeding activity sheet. Class visits: Summerland Primary School, Upper Harbour Primary School, St Mary's Primary School. Illustrator for two children's books featuring native bird species. 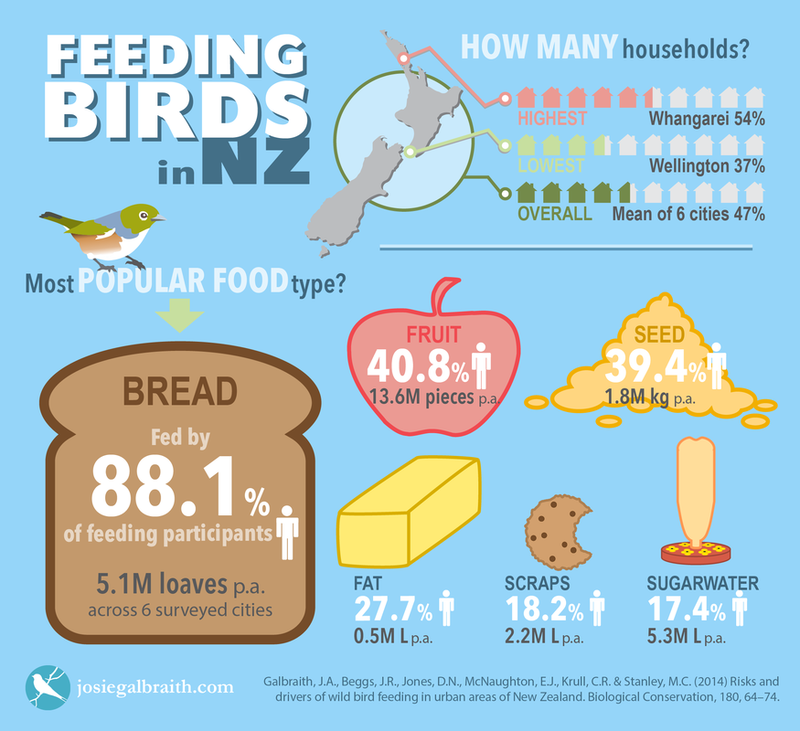 Feeding New Zealand's birds: benign pastime or backyard threat? Invited speaker, Zoological Society of Auckland. July 20th 2017, Auckland. 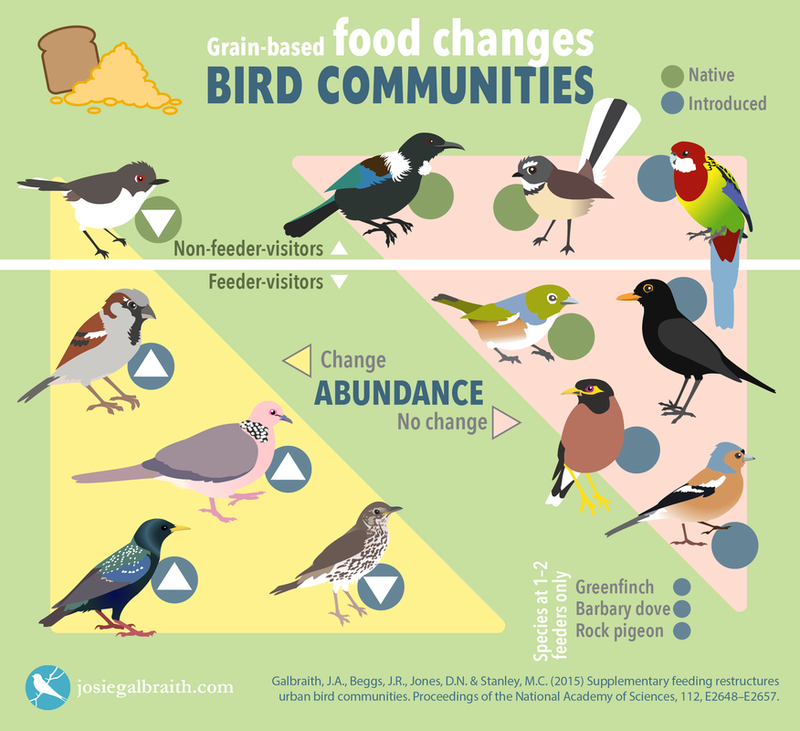 Feeding birds in New Zealand – current practices and implications. Invited speaker, Birds New Zealand, South Auckland Regional Meeting. Mar 8th 2016, Auckland. Urban appetites: feeding birds in the big city. Invited speaker, Birds New Zealand, Auckland Regional Meeting. Sep 1st 2015, Auckland. Feeding birds here, there, and everywhere! Invited speaker, Talking Birds. Auckland Botanic Gardens and Auckland Council community event. Jun 27th 2015. A crust a day gets the birds to stay? Quantifying the effects of a common human activity. Invited speaker, Forest and Bird North Shore. Feb 4th 2013, Auckland. Studying urban birds in Auckland. Invited speaker, Centennial Park Society AGM. May 30th 2012, Auckland. Copyright © 2000–2016 Josie Galbraith. All Rights Reserved.